If your kiddos are 2-3 y.o. and they are jiggling around with music beats- it’s a time to bring them to us! Not just waiting on their older siblings at their Little Stars and Junior classes, but to get an introduction to the World of Dance in a most interesting, fun and safe way! DWS Academy starts the new season with an opening of new classes. TEDDY BEARS Class welcomes very little munchkins to become our students and to learn & discover about their body’s actions, as well while playing fun dance games, stretching and marching with fun music. Boys and girls of ages 4-6 will be immersed in the world of Dance. The class has a program which was specially developed for these ages. It is focused mostly on basic elements of Latin movements with learning of balance, foot placement, coordination, hip & leg actions and rhythm. Warming up in the beginning of each lesson, stretching, very basic elements of other dance styles like Ballet, Jazz and Hip-Hop are also included to the program. 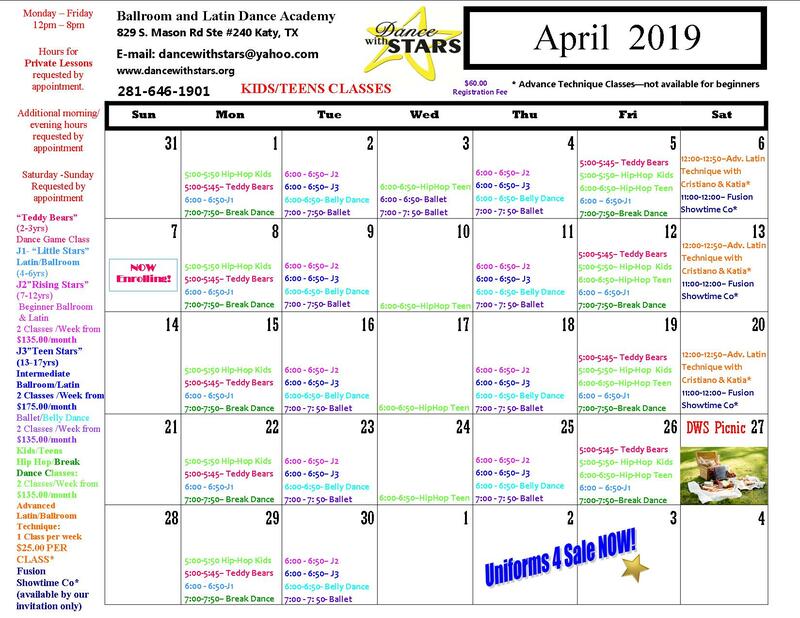 Of course, our Little Stars learn fun and fancy show dances, which you can enjoy at our Studio Shows, Performances & Parties! We use our huge experience to keep our lessons fun and interesting and at the same time teach our youngest students to be very focused, disciplined and motivated. J-2 is the best class for boys and girls of ages 7-12 who wants to learn Latin and Ballroom dancing! Here they will learn dances like the Cha Cha, Samba, Rumba, Paso Doble, Jive, Slow Waltz, Tango, Viennese Waltz, Slow Fox and Quickstep. Our lessons are filled in full with new interesting knowledge and trainings. Fancy showcases and fun parties keep our kiddos interested and motivated always! This class shows our advanced teens the techniques, styling, and what it takes for them to be the best dancer they can be. Ages 13-17. The class is our most advanced junior class. It is for competitive junior couples only. It teaches them the dynamic movements of the Latin and Standard dances that are needed to win the Gold. You’re at a dance battle, your favorite song come on but your so-called sick moves are a little lacking. Don’t worry, come to DWS Academy. Our class is filled with fun and excitement along with knowledge about Hip-Hop. We will teach you trending/OG basic and advance movements to help you stand out on the dance floor. TOPROCK, GET DOWN DROPS, FOOTWORK, FLOORWORK, DOWNROCK, BACKROCKING, THREADING, FREEZES, POWER MOVES, SPINS, ACROBATIC TUMBLING etc. All skill levels welcomed. Beginner, Intermediate & Advanced. Ages: 4+ (Kids Class), 11+ (Teens Class). It is a group of very talented young dancers. These girls and boys have extraordinary talents and abilities to dance. These company travels the town performing their show-stopping moves while wearing their Glitzy costumes! This class is designed to give you the EDGE you are looking for on the dance floor. You will learn styling, technique, and musicality from our highly recognized coaches. you will come out of the class with knowledge and ability like never before.